Why should facilitiesmanagers care about ergonomics? Facility Management explores the subject and consults a number of experts in the field in an effort to answer this question. The word ergonomics tends to conjure up images of typists sitting at screens, covered with dotted lines and overlaid with a set of rules  how to sit properly. But, the truth is far different, says Mark Dohrmann, owner of Mark Dohrmann and Partners, a specialist consultancy in occupational and public health and safety, specialising in ergonomics. Dohrmann notes that ergonomics deals with the science of how human beings see, hear, move, understand and react with their built and work environment. Ergonomics can also be defined as user friendly, or even idiot proof, he adds. of workers. According to Oakman, facilities managers should care about ergonomics because it assists in maximising productivity, and getting the employee and job match right is part of that equation. Oakman states that improvements in job match are likely to reduce injury rates, and that reducing injuries results in decreases to compensation costs and all of the associated costs with injuries, such as replacement, retraining and loss of productivity. Ergonomics is more than just considering the physical environment, she says; it is about looking at the task, the job and the organisation in which an employee works. She states that ensuring that line managers and supervisors are trained to recognise what ergonomics is and when they will need to call an ergonomist to assist is an important part of the process. Some examples of where ergonomics data is commonly and usefully applied to the development and management of facilities include lighting, the prevention of slips and falls, seating and furniture, and glazing. Concerning lighting, Dohrmann states that it needs to be balanced against the way humans see and detect information to ensure suitably well-lit and restful environments for people who work, wait or talk in built spaces. Lighting is not just about delivering enough light; it is the lighting quality that counts. This means the active management of reflections, relative glare, effective curtaining, sunlight management and informed colour choices, he notes. He notes that a study conducted in 2006 in Helsinki  The influence of controllable task-lighting on productivity: a field study in a factory (Henri Juslén, Marius Wouters and Ariadne Tenner)  found that the increase of productivity for the test group was 4.5 percent compared to a reference group. The mechanism for this increase can be improved visual performance, biological effects of light or psychological effects, Stacey notes. He adds that task lights are now available with energy-saving LED technology that provides the same performance as fluorescent and incandescent technologies, and that the invention of single source LEDs has eliminated the issue of multiple shadows, which tend to stress the eye, instead of make it easier to read. When it comes to the prevention of slips and falls, Dohrmann states that ergonomics data about peoples size and movement patterns assists the design and spacing of aisleways, the positioning of critical signs and in choosing colour combinations that are most likely to be seen and understood. Where the cost of slip or fall accidents can be traced back to defects in design, it can prove costly to the designers and others along the chain, he adds, noting that it is far more effective to consult the experts at the design or fitout stage to ensure that the entire project has taken account of critical human factors that affect every built area. The use of ergonomic products such as task chairs, flat screen monitor arms, task lighting and height adjustable desks is one way of improving the health, well-being, comfort, performance and productivity in the workplace, Stacey notes. 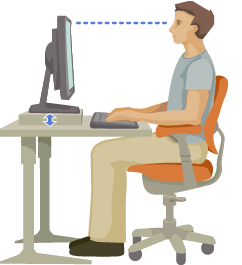 He says that these products work together to give the individual more control over their own environment; for instance, flat screen monitor arms create valuable space on desks and allow the computer user to position the monitor at the correct height and distance from themselves, creating better posture and assisting with increased comfort levels. Dohrmann warns that there is a need to be wary of the label ergonomic, which is often just an advertising tag. A truly ergonomic chair is sized and shaped to suit what it is actually used for  a visitors chair is not a task chair, and a boardroom chair is another thing again. Chairs should have the Australian Furniture Research and Development Industry (AFRDI) rating for strength, function and fit, he states. He notes that professional ergonomists should be consulted for reliable independent advice on the short-listing and selection of chairs for different purposes. Glazing is a critical factor in any sustainable green building, having direct relevance to heat control, lighting management and appearance. Dohrmann notes that glazing and curtain planning go hand in hand, and that ergonomic advice addresses reflection control, restful vision and light management. Regarding disabled access, Dohrmann states that Disability Discrimination Act (DDA) compliance frequently draws on ergonomics advice, since a solution for achieving DDA compliance is usually also a good ergonomic solution. Dohrmann states that it is important to be careful in selecting the right ergonomics adviser, since their key skills will normally be strongest in the area of their primary discipline. He notes that skilled ergonomists usually have a supporting qualification or discipline such as engineering, architecture, physiology or an allied health speciality. If youre looking for ergonomics advice, seek out a Certified Professional Ergonomist (CPE). You can be confident that a CPE is properly trained, experienced and able to provide answers within their own sphere of expertise, he explains. Oakman stresses the importance of using a participative approach and involving the people who are doing the job, the immediate supervisors and their managers. It is important to listen and then use the ideas from the people who are undertaking the work, as they have the best understanding of the work. A good ergonomist will always consult with a range of people involved in the work being undertaken, she notes. Modern ergonomics covers a fascinating range of applications, focused on securing a safe, comfortable and productive fit between built environments and the people who use them, Dohrmann concludes. ← GESAB takes part in the command center of Mecca.